Welcome to our Oceanfront Getaway! Here you will enjoy waking up to magnificent sunrises, the feel of soft ocean breezes and the warm sand of Cocoa Beach right outside your door! 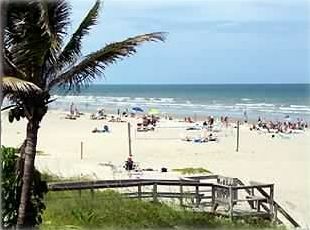 Our Oceanfront Getaway is located in the Heart of Downtown Cocoa Beach. Restaurants, shopping and a variety of entertainment are all just a stroll away! It's only minutes to public country clubs w/golf courses and a pool, World Famous Ron Jon's Surf Shop, Cocoa Beach Pier and the Kennedy Space Center. After a day of sun, surf and sand, enjoy a cool tropical drink at fun filled Coconuts Bar on the Beach, or on your balcony relaxing at our newly furnished beach condo, featuring central a/c, one bedroom with a queen-size bedroom suite, full bath, living area w/full size pull-out, 32' TV and DVD, fully equipped kitchen, washer and dryer and free Wifi. Perfect for up to 4 people. Finish your day watching Sea Turtles or just take a romantic Moonlit walk on the beach. Stay with us and be as busy as you wish or sit back and just relax. It doesn't get any better than this! High top table and two chairs. Pictures do not give justice to the awesome view and great location. The beach is steps from the balcony where we spent our time relaxing and enjoying the sun rise. The condo was very clean , Kathy provided beach towel, chairs , and umbrella to make our beach time even more enjoyable. The location is walking distance to restaurants and shops. This is a great little condo and excellent location. The building was a little noisy for a few nights with partying, but overall a good experience. Kathy was very helpful when we asked questions and it was much appreciated. We are looking forward to staying again. Awesome beachfront condo, everything was spotless and up to date. I will be back! Thank you! My wife and I were looking for a weekend getaway to Cocoa Beach and I found this condo. It was exactly as described. The place was clean, it was easy to get into, and the WiFi worked without flaw. There are a few items that make this place a standout however, the view from the balcony is amazing, and there are stairs from the balcony that take you right onto the beach. You are located in downtown Cocoa therefore, once we parked we never drove again until we left. This was not a problem for us, but the bedroom is separated from the living area by a 4-5 foot wall. I thought it made the place feel more open. I have to end with a big thank you to Kathy as she allowed us to check in early and check out a few hours late. So we were able to spend most of our Sunday on the beach and shower before heading home. This place was amazing! Rates are subject to change until confirmed. All funds due in USD. Nightly rate is based on 7 night stay. 2 nights are $350.